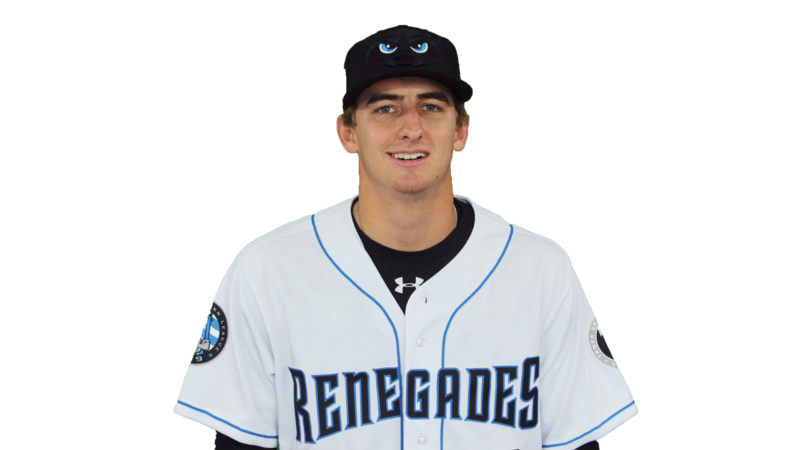 WAPPINGERS FALLS, NY -- First-baseman Jacson McGowan collected three more hits and shortstop Ford Proctor broke open a tied ballgame with a two-run double to lead the Hudson Valley Renegades to a 7-3 win over the Auburn Doubledays Thursday night at Dutchess Stadium. With the win, the Renegades swept the best-of-three Semifinal Series against Auburn, and advance to a New York-Penn League Championship Series matchup with the Tri-City ValleyCats who swept the Mahoning Valley Scrappers in the other Semifinal Series on Thursday. The Renegades started the scoring in the second inning. Singles by first-baseman Jacson McGowan, rightfielder Jordan Qsar and second-baseman Jonathan Aranda loaded the bases with one out, before centerfielder Michael Smith grounded slowly to short to score McGowan and give Hudson Valley a 1-0 lead. Auburn stormed back with two runs of their own in the third. After a double and single started the inning, leftfielder Pablo O'Connor brought in a run on a soft groundout to third. With two away, rightfielder Jacob Rhinesmith reached third on a dropped flyball by Smith, which scored the second runner and gave the Doubledays a one-run advantage. Hudson Valley would respond with a run of their own in the bottom-half to tie the game. With one out, shortstop Ford Proctor walked, went to second on a wild pitch, then scored on a RBI groundball single to right from McGowan to knot the game at three. The Renegades retook the lead in the fifth. With the bases loaded and one out, Doubledays reliever Chandler Day uncorked a wild pitch to score catcher Erik Ostberg from third as Hudson Valley went up 3-2. However, Auburn came right back with a run in the sixth. With a runner at third and one away, second-baseman Kyle Marinconz chopped a ball into leftfield to tie the game again at three. But the Renegades would not be denied as they scored two more in the bottom-of-the-sixth. A single by Smith and a double by leftfielder Bryce Brown put runners at second and third with no one out. After a groundout did not advance the runners, Proctor rifled a two-run double to right-centerfield and the Renegades went ahead 5-3. Hudson Valley added an insurance run in the seventh. Third-baseman Kaleo Johnson was hit by a pitch to start the inning, moved to second on a failed pickoff attempt, advanced to third on a deep flyout, then scored on a sacrifice fly to right by second-baseman Jonathan Aranda to make the score 6-3. The Renegades added one more run in the eighth as two singles and a walk loaded the bases before McGowan lifted a sac-fly to center to make the score 7-3. For McGowan, he finished the series 5-9 with five RBI and two doubles. Aranda went 6-7 over the two games with two doubles, a triple and three RBI. From there, reliever Alan Strong (1-0) was in control for Hudson Valley. After allowing singles to his first two hitters, Strong retired nine of the last 10 men he faced to get the win. The loss fell to Day (0-1) for Auburn after he gave up three earned runs on five hits over two frames. Hudson Valley had 13 hits for the game and 29 for the series. In game two, Aranda went 2-3 with a double and RBI. McGowan finished 3-4 with a double, two RBI and a run scored. Proctor chipped in by going 2-4 with his two-run double and a run as well. Every Renegade in the starting lineup had at least one hit. Auburn finished with seven hits. Leadoff man and third-baseman Cole Dailey was the only Doubleday with one hit, as he finished 2-4 with two singles. Game one of the New York-Penn League Championship Series will commence on Saturday at Joseph L. Bruno Park in Troy. First-pitch is slated for 7:00. Starters have not been announced for either team. The Series will come to Dutchess Stadium on Sunday for a 4:05 start in game two of the best-of three set. All tickets are $2.50, and can be purchased online at hvrenegades.com or by calling the ticket office at 845-838-0094.